The new DAC system was presented and explained by Styrian Minister of Agriculture Johann Seitinger, Willi Klinger (Managing Director of the Austrian Wine Marketing Board), Franz Titschenbacher (President of the Steiermark Chamber of Agriculture), Johann Dreisiebner (Chairman of the Regional Wine Committee Steiermark), Stefan Potzinger (Chairman of Wein Steiermark) and Werner Luttenberger (Managing Director of Wein Steiermark). Werner Luttenberger, commenting on the motivation for development of the DAC system in the Steiermark, said: ‘In order to position the Steiermark and its three winegrowing regions successfully for the future, it is necessary to emphasise the unique selling points and special nature of the region. In the wine industry, origin is the most important element by which growers can rise above the competition and thus market their wines successfully’. For this reason, individuals in positions of responsibility for the Styrian wine industry have pulled together in recent months, participating in the intensive process involved in creating a unique DAC system for the Steiermark. 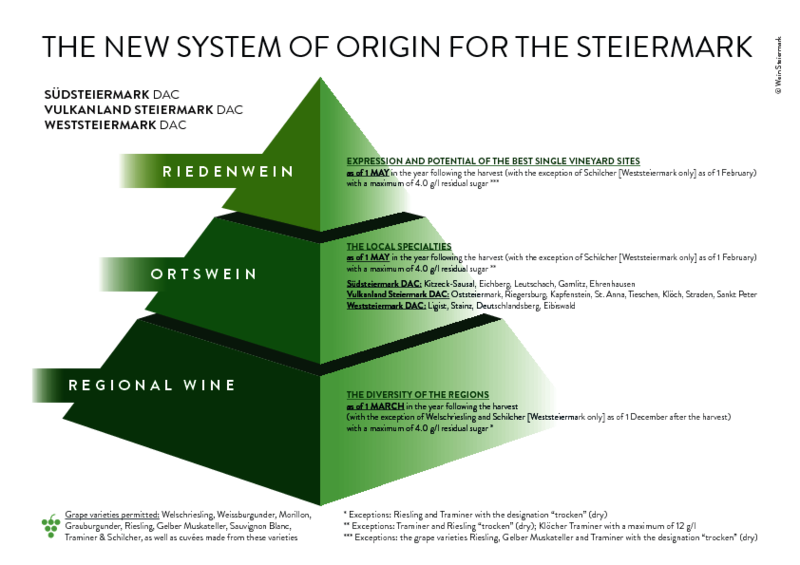 The result is a three-level pyramid of origin, articulated as Regional Wines, Ortsweine (commune wines or villages wines), and Riedenweine (single vineyard wines). Stefan Potzinger, chairman of Wein Steiermark, is convinced: ‘The new system of origin will indeed do justice to the current general quality standard of Styrian wines. And in equal degree, this will make certain that further improvements in quality will develop even more rapidly in the future’. This new system of origin will deliberately emphasise the unique nature and signal virtues of Styrian wine. The traditional diversity of grape varieties will be maintained, whereby on the level of Ortswein and Riedenwein, the focus will be placed upon the locally predominant varieties. The timetable for commercial release of wines was set for the first of March or the first of May, in order that the wines receive adequate time to develop the characteristics typical to their origins and display their full potential, especially on the levelsof Ortswein and Riedenwein. The regional wine committee is planning the kickoff for the new system of origin with the 2018 harvest. The final course for the Styrian DAC system will, though, be determined before by the federal ministry, which must sign off on the regulations before enactment. With the implementation of the DAC system for the Steiermark, the number of DAC winegrowing regions in Austria has now grown to a total of thirteen. ‘The Steiermark has long taken its time over the decision to create a new system of origin for wine, and this is a good thing! Because over the course of innumerable discussions and meetings – also arguments – they have managed to arrive at a functionally outstanding result, one that is advantageous to all parties. I would like to thank all of those who collaborated in the process, and who have placed the common good over individual interests, especially also the younger generation of estate owners, who have brought a new dynamic to the negotiations in the past year. With these three regions of the Steiermark, the number of DACs in Austria has grown to thirteen. I am optimistic now, that with this momentum built up we can bring the four remaining specified winegrowing regions under the DACumbrella by the year 2020 at the latest’. ‘The rousing international success of Styrian wines makes it clear to us what a high level of achievement they have attained. But in no way should this allow us to become complacent, but rather we should every day consider how we can further maintain and reinforce this high quality with professional marketing and modern customer-access. The new DAC system of origins gives us the possibility of putting our finest vineyard sites, which produce our top wines, even more solidly on centre stage’. ‘The “System of Origin Steiermark” – with the three DACs Weststeiermark, Südsteiermark and Vulkanland Steiermark – is the result of a democratic process unique in the history of Styrian wine. Established by the study group ‘Steiermark: the Future’, and coordinated from the ground up by all those in position of responsibility, this step was resolved by the Regional Wine Committee Steiermark on 18 April 2018, and then by the National Wine Committee on 5 June 2018. With these quality-enhancing, clearly articulated regulations for production and marketing, a new era for Styrian wine will begin with the vintage year 2018’.